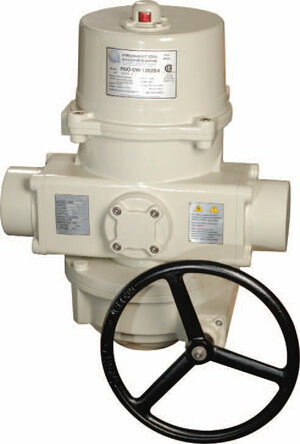 A SPRING RETURN electric actuator designed for load requirements up to 1150 in lbs. The actuator comes standard with two auxiliary switches (Form C), an internal low power heater, a NEMA 4X environmental rating, and in 120/230 VAC or 24 VAC/DC supply voltages. The PBO Series mechanical connections utilize an ISO5211 mounting system, size F10 with an 8 point 22 mm female drive. The PBO Series is offered in two different control modes....On/Off (2 position control) or Proportional (modulating control). Application requirements will dictate whether to utilize a CW (clockwise spring return) or CCW (counter-clockwise spring return) model. Spring return direction is NOT changeable and actuator must be configured for spring direction at time of order.